Judson, Clara Ingram. Flower Fairies. Illus. Maginel Wright Enright. New York: Rand McNally and Company, 1915. Print. Clara Ingram Judson (1879-1960) was an American novelist born in Logansport, Indiana. 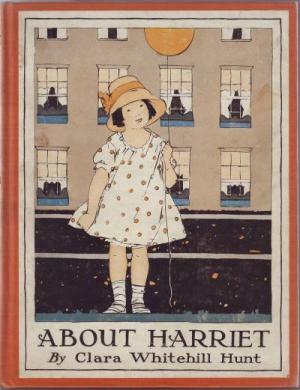 An award-winning American writer during the early 20th century, she wrote a variety of works ranging from cookbooks to children’s stories. During her professional career, Judson published over seventy non-fiction and fictional books for young children. 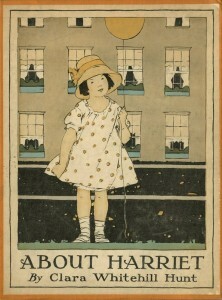 Her first novel for the child was Flower Fairies, published in 1915. 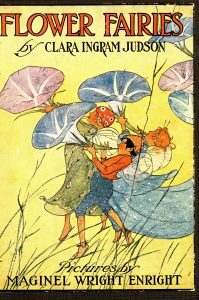 Flower Fairies provides young readers with various interrelated stories about fairies, accompanied with illustrations by Maginel Wright Enright. Enright was greatly influenced by Japanese prints, which inspired her use of watercolour and simple flat shapes as shown in Flower Fairies. Judson’s picture book presents readers with a close insight of fairies’ daily lives, origins, and society. 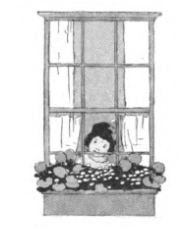 Megan Matsuda’s chosen context examines the flower fairy connection with Great Britain, as well as how this book connects with the United States’ arising environmentalism in 1915. The category, provided by Michelle Christodoulou, will investigate how fairies were represented in Judson’s picture book Flower Fairies,supported by the text and images. We will attempt to show how both context and category examines the connection between fairies and the eco-criticisms of the early 20th century. The book depicts the beauty of flowers using fairy illustrations, enticing children and acting against the modern technology and warfare of the time. By appealing to children, the work presents a positive attitude towards nature. 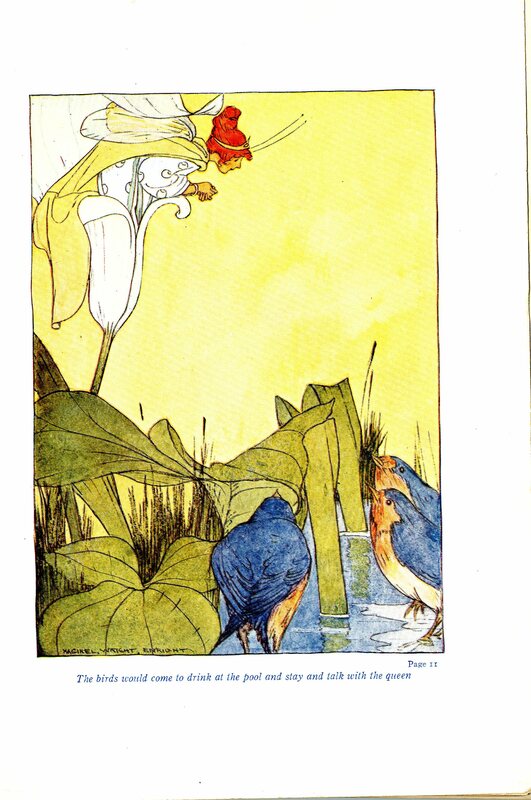 During the time when Judson’s Flower Fairies was published in 1915, the concept of fairies presented in stories and artwork continued to be a popular theme. It was still popular after the “Golden Age” of fairy art and children’s literature, which extended from 1840 to 1870 (Susina, “Dealing with Victorian Fairies”). In 1906, J.M. Barrie’s Peter Pan in Kensington Gardens with illustrator Arthur Rackman had produced its famous fairy artwork, which gave another push of the fairy subject in literature and art. Conversely, the rise of the “flower fairy,” and the notion of using fairies within the realm of nature was not as mainstream in the United States than during the British Victorian era. There, fairies appeared in music, art, literature for both adults and children, and decorative arts for the home. Again, the controversial “Cottingley Fairies” series of photographs taken by two cousins in 1917 in England reinforced the admiration for these small beings. Previously, fairies had been a part of English and Irish folklore since the 14th century (Susina, “Dealing with Victorian Fairies”), but not as widespread in America. Therefore, Judson’s work proves to be one of major influence in the United States, as it was possibly one of the first children’s literature works that mirrored the fairy fever happening in Great Britain during that era. 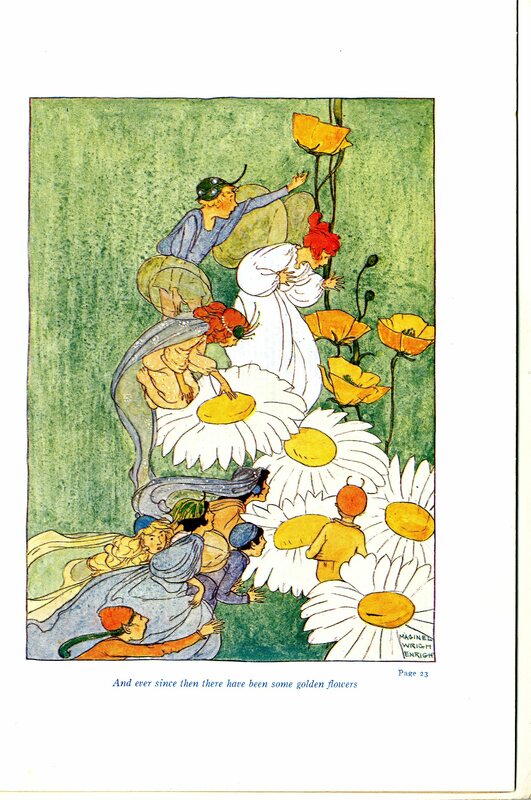 Interestingly, Judson and Enright’s work acted as almost a prelude to the highly established flower fairy illustrations by Cicely Mary Barker, published in 1923. Following Arthur Conan Doyle’s The Coming of the Fairies in 1922, Barker’s illustrations acted as an escape from the Great War and the Depression. In many ways, Judson and Enright’s book did the same thing in the United States, acting as a front against the increasing industry and destruction during WWI. Ultimately, there is a flower fairy connection between Judson’s Flower Fairies and that of other flower fairy stories in English literature and artwork. 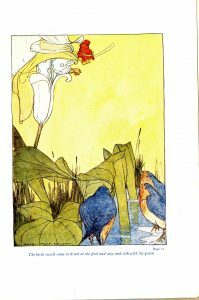 For instance, in the late 19th and early 20th century, there were a variety of recurring symbols and motifs that were seen within flower fairy stories; many of these alluded to older English symbols found in literature. In Judson’s Flower Fairies, some of these are also used, which further shows the connection between the two countries. 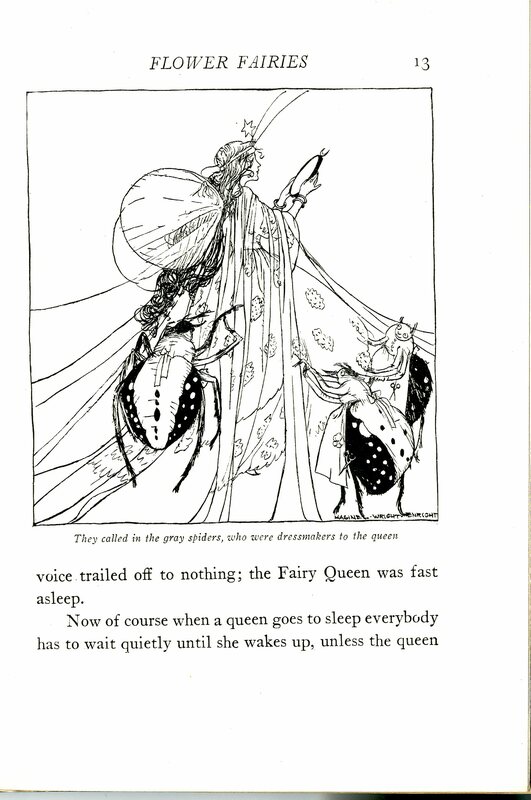 During the reign of Queen Elizabeth I during the 16th century, there was a metamorphosis of her into the Fairy Queen symbol that was seen throughout literature and art during the span of fairy conceptions (Duffy 109). Also, the dress and appearance of fairies that typically wear green and red, with slippers, a cap and golden hair (Briggs 108-109), are also shown in Enright’s illustrations for Flower Fairies. Overall, pictures of sprites among flora have created an industry in memorabilia and stories for many years, (The Daily Telegraph, “Frolicking with the Flower Fairies”) having an impact on Judson’s work. The publication of Flower Fairies was centred around the time of intensifying world tensions culminated in World War I. With the new forms of industrialization, the new technologies were not only harming the environment through war, but also through advances in factories and agricultural machinery. The dispute over American environmental ideology in the early 20th century soon developed into preserving wild areas, growing from the panic surrounding overdevelopment (Black xv). In Flower Fairies, Judson chose to use fairies in order to entice children, depicting the beauty and importance of nature. The short stories that Judson has written within the work all aim to explain an aspect of nature. Whether it is to explain the mythology of certain flowers, or why fairies have special names, all the stories use beautiful language to capture the essence of the landscape the fairies live in. There would be a connection many children would feel to these fairies, which are depicted in both writing and illustration as like children themselves. Through this understanding, the audience of Judson’s can adapt a positive attitude towards nature. There is also a theme of fairies, which symbolize children and the American people, working in harmony with animals and wildlife. This could have been Judson’s intended message or a result of the publication, as the novel was available directly as new eco-criticisms were emerging in the United States. When WWI began, it emerged as a transitional war in which there were new forms of technology mixed with old forms of war (Black 12). This resulted in a brutal warfare system and an immense death rate. Animals were also used to the death, having to be replaced every month throughout the war. This was the context of Judson’s work being published, which in turn acted against the development of mechanized production. Furthermore, child labour was not uncommon at this time. 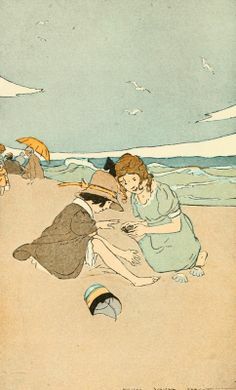 Judson writing a children’s book about flower fairies, before the time of the worldwide popularity of Cicely Mary Barker’s artwork, perhaps speaks to the social setting the United States was situated in. For the work to be successful, the audience needed to be considered. Judson was likely to have known about ideas of environmental appreciation and the desire to revert back to the simple, natural life. Between 1901 and 1907, Roosevelt reserved land from 50 million acres to 150 million acres in national forests (Rothman 52), which shows a desire to keep land away from industrial takeover. It is evident that there was a social criticism on the increasing technology. Through this, a flower fairies book entirely on the beauty and splendor of nature is more than just that. It represents an encouragement to young children and adults to love the environment around them, just as the fairies do. The late 19th century encouraged the popularity of these magical creatures: fairies. In Flower Fairies,readers are given an idea of a fairy’s daily life, and what it would entail. The text explains how big fairies go to work and little fairies go to school. When they were done, they would go out and play till sundown (Judson 6). The fairies’ daily lives represent the ideal life in the early 20th century society. By romanticizing these fairies as innocent, childlike creatures surrounded by nature, it provides young readers pleasure and protects them from the harsh reality. The fairies in the book are human in appearance. However, they are significantly smaller and have wings on their back. As well, the fairies value their appearance. One story in the book, “White Violet,” describes a fairy maid who always wore her finest jewels and clothes. A picture is included, with the fairy gazing in the water. The caption says, “they all dressed to look their best” (Judson 16-17). In most of the images, female fairies all wore long flowing dresses. The aesthetic dress was a popular style of dress during the late 19th century and carried well unto the early 20th century. The dress was made of natural materials, consisting of puffed shoulders and long flowing skirts. During this time, “rational and aesthetic dress reformers, long associated with socialism and bohemianism, promoted the “natural” body with only mixed success” (Maltz 398). The use of natural materials and clothing reflects the environmental ideologies through fashion. Fairies all wear different parts of natural materials from their environment upon their head. The fairies’ connection with nature shows the importance of caring for our environment, especially when World War I was destroying the earth through modern technology. In Flower Fairies, the Fairy Queen governs the fairies. She is a character depicted as beautiful, kind, and wise. All of the fairies hold a great respect towards the queen. For example, when the Fairy Queen summoned all the fairies for a party, they all made sure to dress their best to impress her. 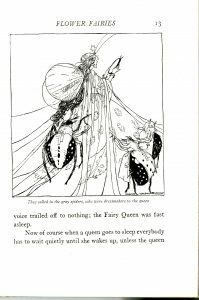 In the story “Fairy Names,” the Fairy Queen’s duty is to name all the fairies in order to distinguish them from one another. As she gathered all the fairies in her kingdom to name them she fell asleep. The fairies did not dare wake her up in fear of displeasing her. The connection between the Fairy Queen and nature may reflect environmental ideologies. During the naming ceremony, the Fairy Queen decided all fairies would be named after whatever is on their brow; a twig or leaf. This demonstrates how the Fairy Queen’s integration of nature in the book reflects 20th century environmental ideologies. Furthermore, Susina observes how fairies during the nineteenth century were depicted as governess with wings. Thus, it can be argued that Judson’s Flower Fairies is a fairy tale for children not only to entertain them, but to teach morals to keep them away from the dangers of society, and enjoy nature. The other aspects demonstrated throughout Flower Fairies are different ages, genders, and ethnicity groups. The book shows different ethnicities supported by Judson’s images. In the book, there is an image of two fairies sleeping. One fairy is a Caucasian fairy with red hair; the other could be a Japanese fairy. In contrast to the other fairy, she has dark hair styled in a Japanese bun and she’s wearing what looks to be a kimono. 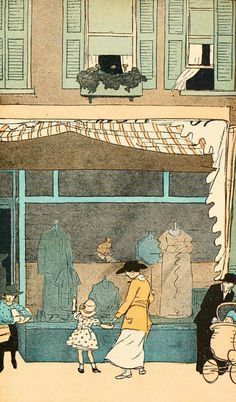 The illustrator, Maginel Wright Enright, was greatly influenced by Japanese prints, so perhaps she added a Japanese fairy in the book to reflect her interest. As well, there are various age groups and genders. Fairies are represented as adults and children. Although there are children and adults there are no male adult fairies. Judson’s Flower Fairies was published around World War I, where there was a great absence of men due to war. Then, “women began flocking factories, and working in industries in order to support their families while their male relatives were away at war” (Sandman). 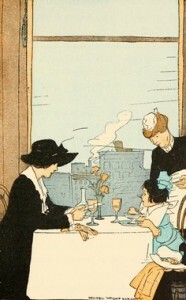 Judson reflects early 20th century American society. In order to protect children’s harsh reality and absence of male family members, Judson uses nature and beauty. The book shows the relationship between fairies and nature. Nature is very important to the fairies’ daily lives. Fairies use flowers as a source of shelter, food, and tools. The front cover has fairies utilizing flowers as trumpets. 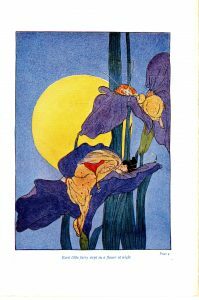 Also, flowers are used as a bed for the fairies and, “just as the sunrise broke, the flowers would unfold its petals ever so little to wake up the fairy” (Judson 5). The little fairies symbolize children and the need to connect to nature. “There is a large body of literature indicating substantial benefits for health and wellbeing are to be derived from contact with nature and exposure to natural environments generally” (Maller 522). 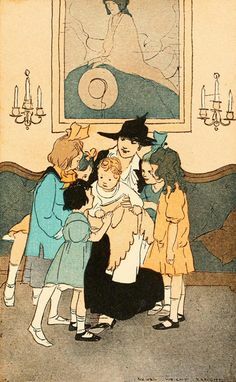 The little fairies symbolize children and the need to connect to nature especially during a stressful time when WWI was happening, Judson uses nature to entice young readers. In the story “fire”, it describes when fairies discovered fire for the first time, and went to the Fairy Queen to tell her their discovery. To show her how the fire looked, they painted flowers the colours of flames. So when you see red geraniums it is to remind people the strength of flames and when roses are crimson it makes people remember the warmth of flames. Overall, all these stories have etiological purposes to explain flowers to the children. Thus, providing stories for the children about the flowers brings children closer to nature, and highlights the environmentalism of the time. With influences from Britain’s Victorian era in Judson’s work, the fairies represent both a spiritual creature and the figure of the American child. This means the child is both characterized in the book and are the main readers, ensuring that the readers identify with the fairies. When they read Flower Fairies, a positive attitude towards nature emerges. Generally, the book is made to appeal to children, which furthers the idea that society, especially at a young age, should enjoy and respect nature. In an era of modern technology destroying the earth through warfare, Flower Fairies opposes this idea. The book ultimately gives forth a representation of beauty, presented by the fairies and flowers and through illustration and text. 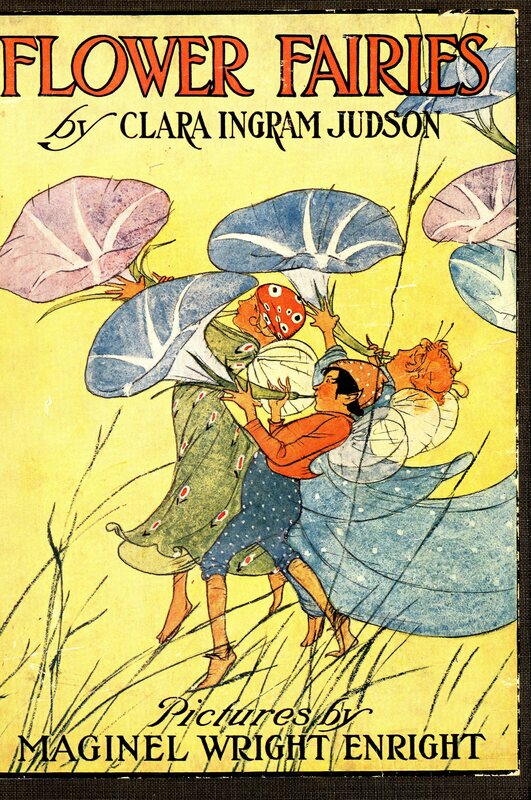 Judson and Enright created a children’s book that was one of the first in the United States to use the flower fairies motif. It was not until a decade afterward that flower fairies, with the artwork and literature surrounding them, started to become popular worldwide. Judson’s work was not just at the forefront of American fairy literature, but gave forth an idealized and utopian perspective of nature. Yet, can this not be said for all children’s books? Judson encourages her readers to help strive for a better world, and be kind to all, no matter if flora or friend. Black, Brian. Nature and the Environment in 20th-Century American Life. Westport: Greenwood Press, 2006. Print. Briggs, Katherine M. An Encyclopedia of Fairies: Hobgoblins, Brownies, Bogies, and Other Supernatural Creatures. New York: Pantheon Books, 1976. Print. “Frolicking with the Flower Fairies.” The Daily Telegraph: 2. ProQuest Newsstand (Canada). 16 Jul. 2011. Web. 24 Nov. 2011. Maller, Cecily Jane. “Promoting children’s mental, emotional, and social health through contact with nature: a model.” Health Education 109.6 (2009): 522-543. Web. 22 Nov. 2011. Maltz, Diana. “Dress Culture.” English Literature in Transition, 1880-1920 54.3 (2011): 396. Print. May, Maggie. “Maggie May’s Historic Clothing: Period Attire for Ladies and their Children.” Maggie May Fashions. Maggie May’s Historical Clothing, 2000. Web. 22 Nov. 2011. Pemberton, Marilyn. “Enchanted Ideologies: A Collection of Rediscovered Nineteenth-Century Moral Fairy Tales”. Reviewed by: Jan Susina. Children’s Literature Association Quarterly 36.3 (2010): 346-348. Web. 17 Oct. 2011. Sandman, Catlin. World War 1. Jarred Joly Tripod, 2006. Web. 22 Nov. 2011. Susina, Jan. “Dealing with Victorian Fairies.” Children’s Literature 28.00928208 (2000): 230-7. ProQuest Research Library. Web. 24 Nov. 2011.